前一篇 http://benjr.tw/95761 使用 Nginx 來架設 Web (HTTP) 伺服器,但 nginx 並不認識 PHP ,這時候開啟 PHP 檔案 Nginx 會把它當作一般檔案來下載,所以需要透過另外一個服務 PHP-FPM (FastCGI Process Manager) 將所有 PHP 導向給他 . 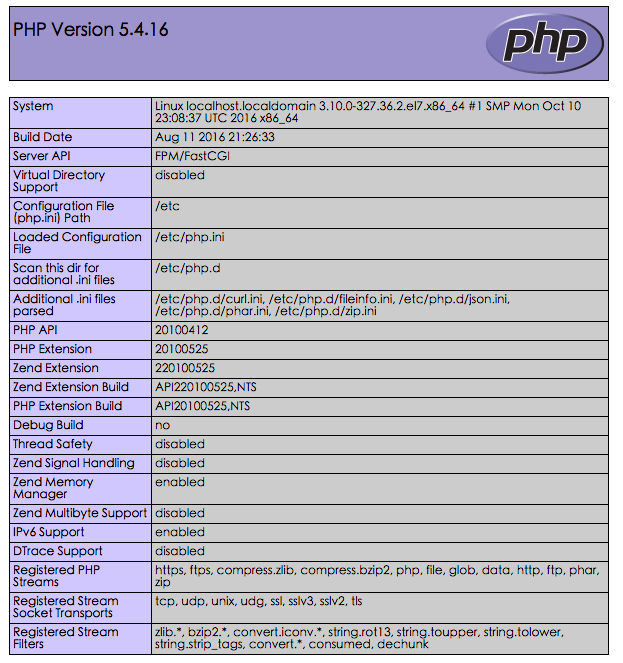 10月 13 21:10:52 localhost.localdomain systemd: Started The PHP FastCGI Process Manager. 預設的 nginx 並不會把 PHP 導向給 php-fpm ,下面是 nginx 的原始 default.conf 設定檔,我們只需要修改 location ~ \.php$ 這一部分的內容即可. 修改過後的 location ~ \.php$ 的內容. 如果出現 File not found. 檢查一下 /var/log/nginx/error.log ,基本上都是 root 設定上的問題. FastCGI sent in stderr: "Primary script unknown" while reading response header from upstream, client: 172.16.15.1, server: localhost, request: "GET /phpinfo.php HTTP/1.1", upstream: "fastcgi://127.0.0.1:9000", host: "172.16.15.192"
FastCGI sent in stderr: "Unable to open primary script: /etc/nginx/html/info.php (No such file or directory)"